NTSC Video - Whassit all mean anyway? please link to this page if you do! This page is an updated version of this one where Traci first appeared as our guinea pig. The deficiencies in human vision are many, but few are as striking and demonstrable as this one. It's a fact that our perception of colour is not as detailed as our perception of black and white. This is the primary reason the NTSC standard works as well as it does - we can't tell that it's ripping us off. If it looks just as good then it must be jsut as good, right? This is an unmodified picture, straight off the digicam and reduced in size. 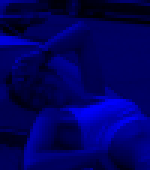 Now what I'm going to do is reduce this image into its primary colour components, each consisting of a single hue image of 256 shades: one red, one green, one blue. If you look closely you may notice the blue one looks kind of dark and blurry, and the green one looks pretty clear. The same image in 4 flavours. If you combine the three single-colour images you'll end up with the one on the left. The next step is to reduce the resolution of one layer, and recombine the images. Here's a small version of what each slice looks like when there is a 3x reduction in detail. Each pixel in these images is nine times larger than the ones above. As you can see, reducing the blue detail hardly makes an impact at all, even when you know it's there. Try looking at the diagonal line on the hood of the car. You can just barely make out some yellow fringing, a bit of stair-steps where the blue detail is reduced. This is why DVDs, JPGs, and NTSC video can cut the detail in the colour channel - sometimes to an extreme extent - and still not cause riots when consumers realize they've been bilked. They just don't notice, and if you don't notice you don't care. You sure notice when someone tampers with your green!! The difference with red is certainly noticable, but not to the same extent that the green channel is. Mucking with the blue channel of course leaves you with basically no effect. This is how DVDs work: a high res green image and two low-res images, one for red, one for blue. Please check this page for visual evidence of the effect this chroma subsampling can have on JPG images, and ways you can avoid it.